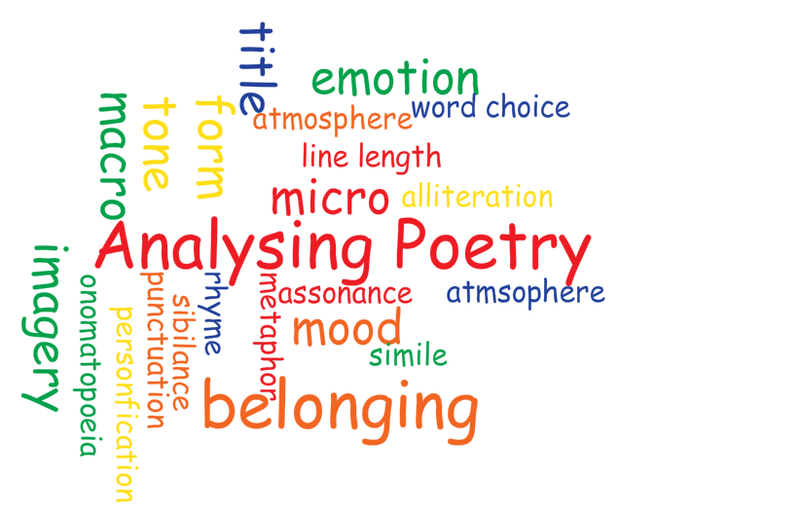 When analysing poetry, there is often discussion about how deep should we annotate an individual poem. I tend to think that the more techniques or language features you can identify, the better. This is great practice for the ‘unseen’ texts in Paper 1 Section 1 in the HSC. which can be paused, and take notes on each poem. When drafting paragraphs, you can then include the ‘macro’ ideas, especially specific terms that represent belonging, in your topic sentence. Subsequent sentences should then include the micro details – specific examples of different features, perhaps three or four per paragraph. Choose the most appropriate features which best amplify the aspect of belonging you have identified. Your final sentence could link to the next paragraph. You may be able to include an evaluative term, too. If you are studying a verse novel, it is probably useful to situate an individual poem within the narrative. This could be in your topic sentence, and could also provide a link in your final sentence of each paragraph. Finally, pay attention to the word count when writing an essay – you will have to dare to leave something out! Remind yourself that eventually, you will have to write an exam that only allows 40 minutes per response. Better marks are awarded to students who explain their ideas through carefully selected features and examples using sophisticated language. My advice is to draft, draft and draft some more with the aim of writing with clarity and economy.